Mon -Fri 8-5 - Evening/Weekends by appointment at no extra charge! Be careful who you hire, do your research, and make sure you don't become a victim. Recently the people in the city of Madison and reputable locksmiths in the area have fallen victim to a group of untrustworthy locksmiths who are taking advantage of locked out customers in a bind. This is not happening only in Madison, but all over the country leaving customers wondering if the locksmith they are about to call is real and reputable or an imposter ready to take advantage of them in a desperate situation. The scammers acting as locksmiths set up multiple bogus aliases for locksmith services in a major city, like they have done in Madison. No matter which one of the aliases the customer calls, the call is routed to a call center where a quote is given over the phone. These dishonest locksmiths show up in unmarked vehicles, charge for extra and unneccesary services, intimidate customers and in some cases refuse to hand over your keys until you pay the price they have inflated. 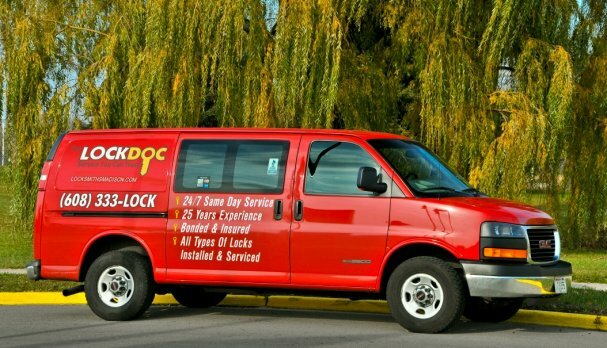 What can a consumer do to ensure they are hiring a reputable locksmith? Ask questions before you agree to a service. Check that they have insurance. Ask for their policyholder's name. It's not always possible in an emergency situation to do your research, but if you have the time to research a prospective locksmith find out about them. Do they have an A+ rating with the Better Business Bureau? Do they have good testimonials from previous customers? Are they licensed and insured? Will they quote a firm price before the project? Find out the quality of the materials will they use if they are replacing hardware. Ask if they have a physical address. Get references from friends and family if possible. Find the name and number of a locksmith that you trust and program them into your cell phone. You never know when you'll need it.